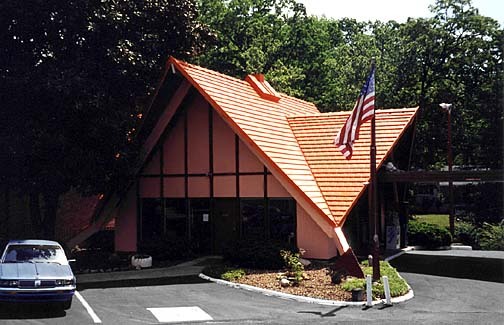 When it opened in the summer of 1967, the HoJo's In Town Motor Lodge and Restaurant complex was the second of the three Howard Johnson's complexes that were eventually built in the Knoxville area. 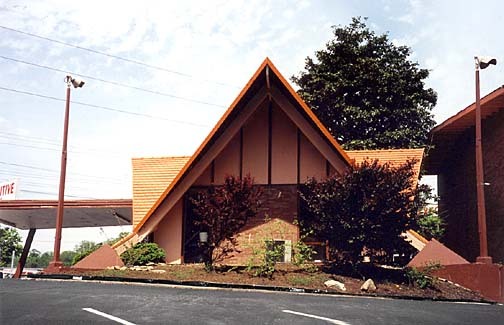 The relatively compact 60+ guest room facility was constructed on a gently sloping parcel of ground and featured only one three-story guest building. 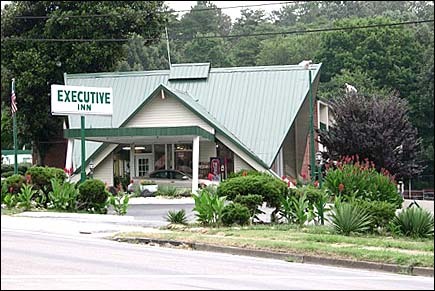 Lasting 17 years or so, Knoxville-In Town was removed from the list of HoJo's during the 1980s purges, and by a 1984 AAA TourBook for Tennessee, it was listed as the Executive Motor Lodge (later 'Motor Lodge' was dropped in favor of the more prestigious sounding 'Inn'). 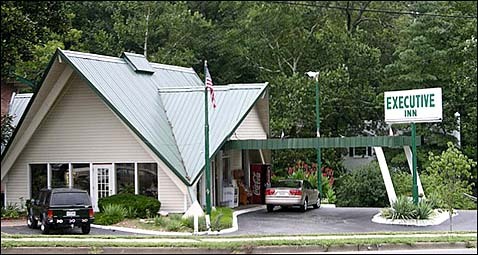 The adjacent Restaurant was most likely to the left of the Gate Lodge and succumbed to progress when the nearby Hardee's was built on its former site. 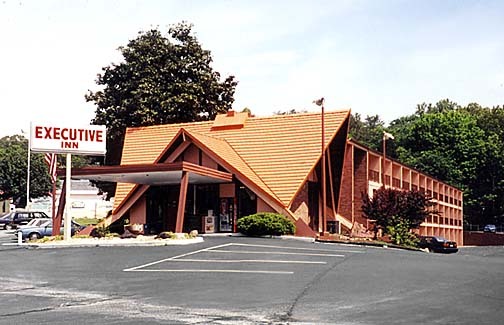 Nicely preserved as recently as Phil Edwards' visit, the old Motor Lodge was unfortunately remodeled not long after 2002. 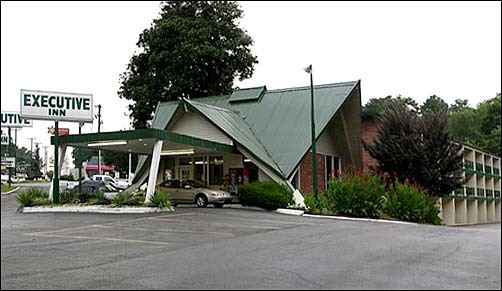 Lesson to the story is that what you don't document today, will be gone tomorrow--so take lots of pictures and go inside too! 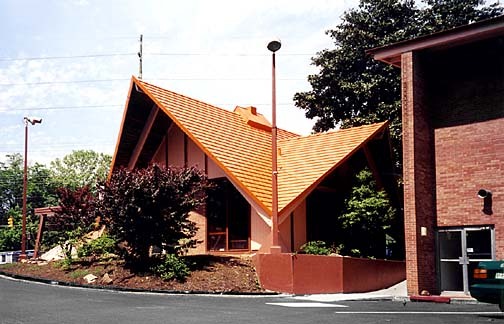 Sadly the Gate Lodge's spectacular gleaming Orange Roof was replaced with dull green sheet metal, and siding was plastered over the sides of the a-frame structure. 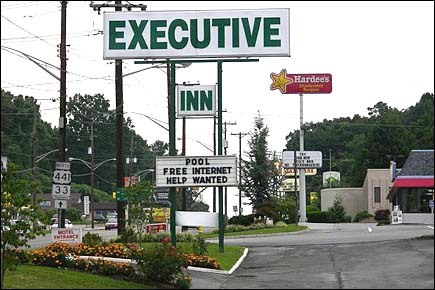 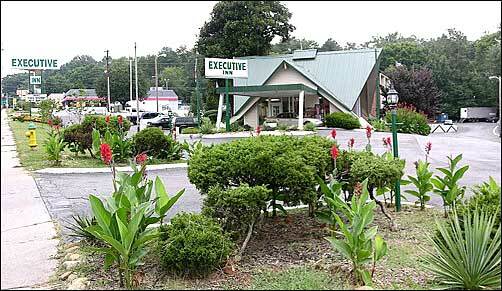 Note that the Executive Inn's street sign continued to utilize the original HoJo's reader board. 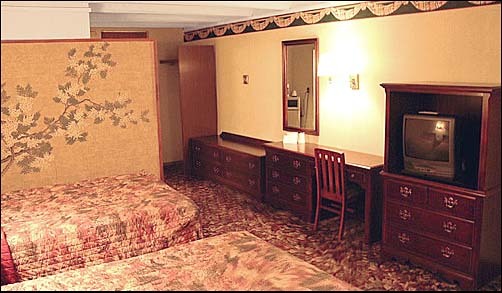 Perhaps the greatest tragedy wrought by the Executive Inn's circa 2005 remodel was what happened to the previously intact HoJo's rooms. 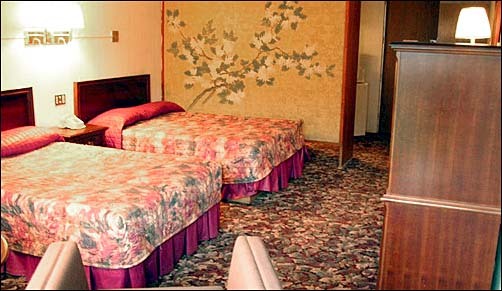 The original rich walnut paneling was sloppily painted white (even in these low-res motel photos you can see where the painter messed up the edge of the privacy screen). 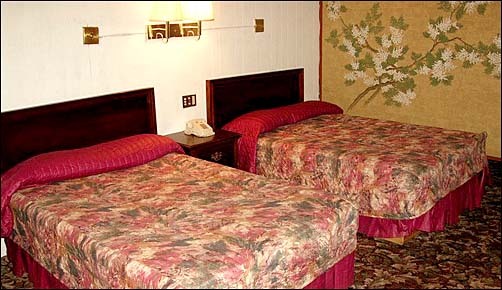 Note the inappropriately 'busy' carpeting too. 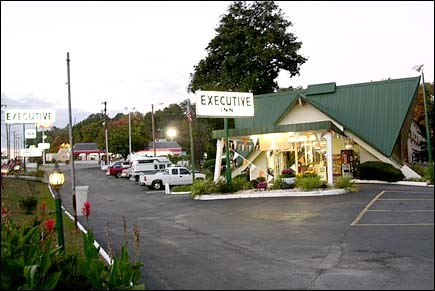 If there is a bright spot, it is that the Executive Inn might be one of the last former Motor Lodges to retain intact privacy screens complete with "Oriental" themed design.